An awkward family unites after losing one of their own and is left to compare memories. This multi-perspective account of coping, love and, of course, karaoke will leave you dizzied and enamored. Read it: On a warm summer's evening before meeting up with friends. "A guy that really, really looked a lot like Steve Perry, the singer of Journey, sang 'Don't Stop Believin.' Puffy, unbuttoned white shirt tucked into jeans, the guy really, really sounded a lot like Steve Perry too." Gabe Durham revives your subdued memories of bug juice, failed attempts to excel at archery, popsicle-stained kisses and grass-stains. That's right, he brings you back to camp, and he unearths all of the confusion and complex politics that accompanied it. 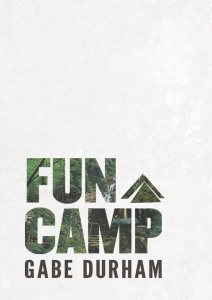 Read it: At camp, duh. "Weird thing happened yesterday after the Family Matters Skit. What? What do you mean what Family Matters Skit? The one my cabin did. You missed it?" In this world Ryan Call creates, the Weather is not so different from power-mad Zeus on high – it mockingly erodes the earth, cracks the sky like egg shells; you rally with the protagonists and your support gives them power – lash back out at the clouds! construct a city in the troposphere! tape together the firmament! Read it: An airport terminal or beach-side. "People had only recently begun to carry about them their own private weather. You could see the burden upon their bodies as they wiped at the veils of rain across their faces, worried at the dust storms flurrying from their hair." Read it: Out loud on your front porch (ideally to someone named Tina). "People have friends. They call friends and say words./ They exchange glances and noises./ One person buys another person dinner!/ One person has an idea and they ask another person/ for an opinion!" Sixteen stories, deep and rich, take you through the mire of life gently. Hirsch's characters are broken down, perseverent, and isolated. These are authentic accounts of humanity, filled with beauty and damnation. Read it: Front porch swing at night with a cold beer. "Right from the start, Cris was pretty certain she could get me pregnant. It started on our honeymoon." Naked Summer reminds me how thick the mid-western summer air is, the sound of cicadas quaking in the air, the tug of burnt skin peeling off of my nose; it reminds me the land is flat and harder than cement and how it will take me where I want to go if I let it – the trouble is figuring out where to go. Read it: Outside, preferably barefoot in the grass. "The entire month of June passed them by. He saw Annie every few days, when she had time. Bobby generally felt better. The summer might turn out okay. They still spent most nights at her place, but twice she had stayed at his apartment." Book reports are due August 31. Aand don't forget to answer the essay prompts. JUST KIDDING, IT'S SUMMER. Short descriptions of each title are courtesy of Vouched Books. Thanks, Vouched!